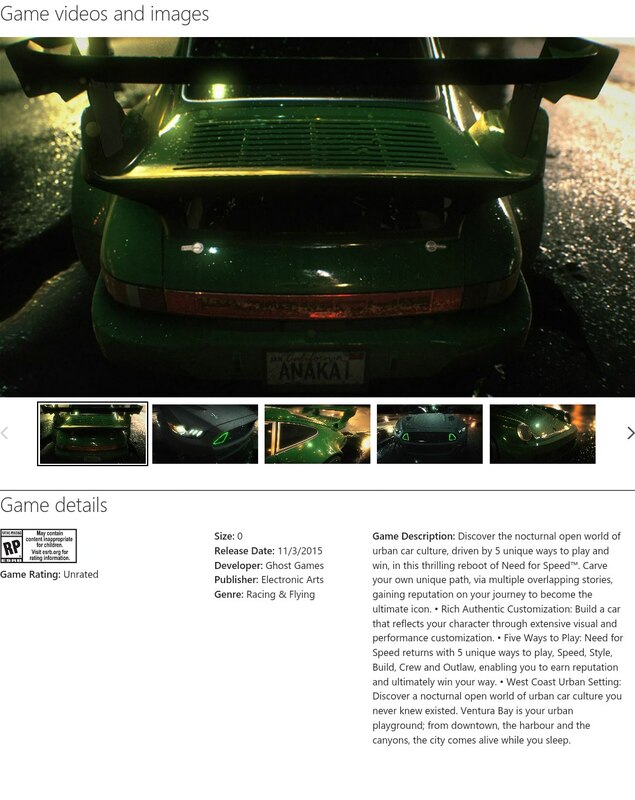 The Xbox store inadvertently listed details on the Need for Speed reboot before quickly taking down the info. But it was too late – we’d already seen everything. Including the November 3 release date. Reddit users spotted the page and took a screengrab before it disappeared. The reboot was announced last week and we already know it’ll use the same engine as Star Wars: Battlefront, and if the details in the listing are to be believed, a November 3 release date can be added to the pile of things we know. Apparently the reboot will feature “5 unique ways to play, Speed, Style, Build, Crew and Outlaw” and will be set in the fictional West Coast city of Ventura Bay with an emphasis on after-dark activities. The game had an Autumn launch window so this isn’t too far fetched. The Need for Speed reboot will be released for PC, PS4 and Xbox One. Very possibly on November 3. More details will be revealed at EA’s press conference at E3.